Shake well before use. The Liquid Pigments can be mixed together in order to obtain new colours. 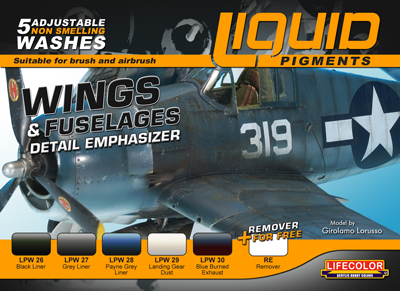 The Liquid Pigments can be applied by brush, airbrush or any method you prefer. Once applied, the Liquid Pigments can be removed partially or completely from the treated surfaces using a brush or a cotton bud moistened in the Remover. If just applied, you can remove the Liquid Pigments with only water. However, the use of the Remover is always recommended because it is able to completely eliminate the very dark stains or blots from light surfaces. Preferably use Liquid Pigments on satin or gloss surfaces. Applying a second coat with a different Liquid Pigments colour on the same area, the Liquid Pigments will be mixed together. In order to avoid that, please seal the work with a thin coat of transparent satin clear (Lifecolor LC77). The locked work will no longer be removable with Remover. Apply Liquid Pigments pure or diluted with water. To highlight panel lines, lightly moisten the panel lines with water and touch Liquid Pigments to the corners of the junction; or follow the groove with a fine brush dipped in the chosen Liquid Pigments. 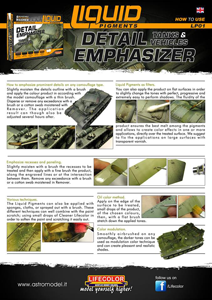 Remove traces leaked from the panel lines with the Remover. To emphasise bolts or protruding details, moisten the areas to be treated and apply the chosen Liquid Pigments with a brush. The excess Liquid Pigments can be removed completely or faded out with a brush. The Liquid Pigments can be used with the same technique as oil paints, so they can be stretched or mixed directly on the treated areas with a dry brush or any other tool. the Liquid Pigments can also be used as a filter for modulating light or dark areas on a surface. Apply Liquid Pigments with an airbrush without adding water. Remove or correct the product with brushes or other instruments moistened with the Remover. It is also possible to move or accumulate the Liquid Pigments on a surface by spraying it away with the Remover using the airbrush after the Liquid Pigments have dried or by blowing only air on the Liquid Pigments before the Liquid Pigments have dried. Moisten the sponge or similar in the Liquid Pigments, discharge the excess product on paper and apply on the model.